It is true that Astrology is a science of tendencies and a fatalistic or deterministic approach is not called for. In this connection let us recall the principle of “Astrology using Astrology we can only indicate what may happen in future. As our Rishis said, it is only Brahma who can exactly tell what can happen. Astrology is only capable of indicating tendencies and likelihoods, the user of this service/product should treat these predictions with due care and caution. Our Divine Astrologer Thetiyur V.Mahadevan’s predictions were appreciated by all. He not only predicts but also suggests remedial measures to be done after analyzing the horoscopes individually. His predictions are more accurate and in easy language to understand. 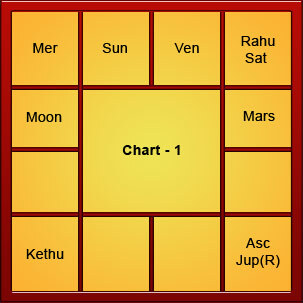 Basic Horoscope contains Birth details,Udayathi Naligai, Janma Lagna, Janma Rasi, Janma Nakshatra, Padam, Tamil year, Month, Day, Ayana, Rithu, Thithi, Vara, Yoga, Karana, Nirayana Graha Sphuta, Rasi, Navamsa, Dasa Balance, Nirayana Bhavasphuta, Bhava, Hora, Drekkana Sapthamsa, Dhadasamsa, Trimsamsa, Ashtakavarga Details with chart, vimsotthari Dasa Bhukti Detais. Birth details,Udayathi Naligai, Janma Lagna, Janma Rasi, Janma Nakshatra, Padam, Tamil year, Month, Day, Ayana, Rithu, Thithi, Vara, Yoga, Karana, Nirayana Graha Sphuta, Rasi, Navamsa, Dasa Balance, Nirayana Bhavasphuta, Bhava, Hora, Drekkana Sapthamsa, Dhadasamsa, Trimsamsa, Chaturtamsa, Dasamsa, Shodasamsa, Vimsamsa, Chaturvimsamsa, Bhamsa, Khavedamsa, Shastiamsa, Ashtakavarga Details with chart, Vimsotthari Dasa Bhukti Detais. Vimsotthari Dasa Bhukti Anthram details. Detailed Horoscope with Physical Appearance, Mental Tendencies, personality, Health, Finance, Love and Marriage, domestic Environment, Profession, Lucky Number, Lucky Days, Lucky Color, Lucky Stones, Benefices, Malefics, With TWELVE BHAVA PALAN. Boy Girl particular, Rasi Chart, Planetary Disposition, Mahadasa Duration, Dasa Santhi, Planetary concord, Papa sankhya, Nakshatra concord. And Divine Astrologer Thetiyur V.Mahadevan’s opinion.